When visiting Milan many years ago, we did as the Milanese do, and started each day with a small espresso and a light, incredibly delicious brioche. Our typical breakfast spot was a tiny walk-in coffee shop with chipped tile floors and only enough room for a handful of people to order and then stand and eat their brioche while dipping it in a small brown cup of espresso or cappuccino. I haven’t been back until this past week, when I walked into Spella Caffe (note the Italian spelling) in downtown Portland and was transported back to what felt and looked like one of those little closet-sized cafes on a street corner in Italy (I’ve heard that Spella claims to have Roman, rather than Milanese, influences, but oh well). Only Spella is sandwiched, literally, between two high-rise buildings on the bus mall in Portland. 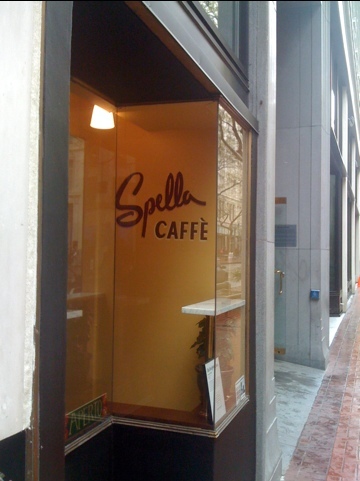 Location: Spella Caffe started out in a coffee cart a few years back, but is now located at 520 SW 5th in a long, narrow space with sunny yellow walls, a small counter and a wood-and-glass display case full of tempting baked goods. The café is only large enough to order or stand to drink your coffee, but on nicer days than the one on which I visited, Spella offers a few Italian-style café tables and chairs placed outside on the wide sidewalk. Coffee: I first experienced Spella’s Italian roasted coffee at Alma Chocolate, one of the dozen or so retailers that carry the local hand-crafted coffee, and loved it – a variety of complementary flavors resulting in an amazing drink, hot or cold. Owner Andrea Spella roasts beans once a week in small batches and sells one-pound bags in the café for around $10, unheard of at most Portland indie roasters. Cool stuff: It’s small, it’s intimate and it really feels like an escape to another world, complete with tile floors, retro logo and homemade gelato from an artisan maker in Eugene (which I haven’t yet tried). Plus, Spella Caffe-roasted coffee is very tasty. 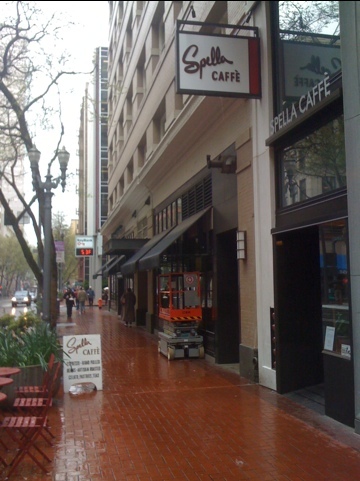 Not so cool: Once you leave Spella Caffe, alas, you’re not in Milan but back on the bus mall in downtown Portland.